Helen Oyeyemi is a novelist you may or may not be familiar with. She was listed as one of Granta's Best Young British novelists in its most recent incarnation, and was a guest at the 2010 Perth Writers Festival, on the back of publication of her book, White is for Witching. Oyeyemi's previous novels also include The Icarus Girl and Mr Fox. This novel, her first since being listed by Granta, is perhaps her most ambitious yet; Boy, Snow, Bird is an updated version of the Snow White myth which uses different cultural understandings of the fairy tale and of womanhood to tell a story of belonging in mid twentieth century America. It begins with Boy Novak, a fair skinned, fair haired New Yorker who escapes from her brutal rat-catcher father, Frank, to a place called Flax Hill, Massachussetts (because it is the furthest stop away from home that the bus will take her.) Arriving in Flax Hill is like the arrival of the beautiful princess in the medieval village. Flax Hill is a town of artisans, where everyone has a craft. There, Boy's craft appears to be her beauty, something which she feels disconnected from even though she is almost aloofly aware of it. Whilst living in a boarding house for young women (this is the 1950s after all), she meets a woman named Webster, who teams up with Boy in order to provide a date for a friend of her regular beaux. This man, the 'prince' of the story, is named Arturo Whitman. Despite not feeling much passion for Arturo (and in fact being in love with another man), Boy marries him for the stability and 'normal' life that he represents. She then transitions from fairy tale princess to stepmother, as Arturo has an almost inhumanly beloved child named Snow, and is a widower. At first, Boy is taken in by the charm of Snow, but she comes to see her as unnatural after the birth of her own child, a girl named Bird. When Bird is born, she has dark skin, and exposes the Whitman's as light-skinned African Americans who have become Massachussets socialites almost by accident, after Arturo's father managed to walk into a golf club un-noticed. Snow has been raised in absolute ignorance of her true heritage and the kind of treatment usual for people of her 'skin colour' at the time. Fearful of what Bird's arrival will do to the family's reputation, the Whitmans beg Boy to send Bird away, but she sends Snow instead. Her transition to evil stepmother is complete. The novel then switches point of view, and the thread of the story is taken up by Bird, years later. Snow is still away from home, living with her Aunt Clara who is dark skinned like Bird. She and Bird exchange letters, talking about their strangeness in worlds where they know they don't quite fit. This manifests itself in bizarre ways, such as Bird's ability to talk to spiders, and her not always appearing in mirrors. The cast of the novel is almost entirely female, and explores a full range of feminine roles, from the socialite mother in law, to the old biddie, to the tough woman journalist, and also explores the silent hardships women have endured over the centuries. One character, Mia, has an abortion, but as the event is told from 13 year old Bird's point of view, she assumes that her 'aunt' Mia is dying. She also overhears her mother telling a strange man that she loves him over the phone. The world of the woman in 1950s and 1960s America is almost as difficult as the world of the African American, although the discrimination is not so overt, says the book. These women's lives are contrasted against various fairytales, and it is shown that the solution to all problems is not always love, marriage and babies. There were some indications throughout the book that we were supposed to see Boy as a somewhat unreliable narrator, but her earnest voice, and her cold, emotionless treatment of the world made her easy to believe although not easy to feel compassion for. It is Bird who most comes alive on the page; a tenacious mix of Harriet the Spy and something completely new. I would have liked to have seen more from Snow's point of view as well, but her silence did add to the mystery of her character. 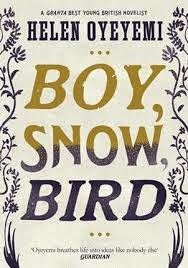 While I did not love this book as much as I loved White is for Witching, Boy, Snow, Bird is still a literary gem, and I give this book four out of five stars.